In celebration of 15 bestselling years in print, this high-quality collector’s edition of Blue Ocean Strategy offers a superb reading experience for years to come, with a hard cover constructed of quality man-made material, with the look and feel of real leather (Kivar Newport Blue Llama) and gold Lustrofoil debossing on the cover and spine. A book for yourself or a lasting gift for your manager, colleagues, clients, and teams. The global phenomenon that has sold 3.6 million copies, is published in a record-breaking 44 languages, and is a bestseller across five continents—now updated and expanded with new content. This global bestseller, embraced by organizations and industries worldwide, challenges everything you thought you knew about the requirements for strategic success. 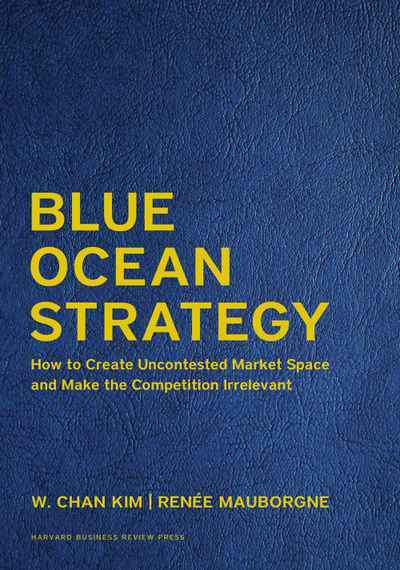 Now updated with fresh content from the authors, Blue Ocean Strategy argues that cutthroat competition results in nothing but a bloody red ocean of rivals fighting over a shrinking profit pool. Based on a study of 150 strategic moves (spanning more than 100 years across 30 industries), the authors argue that lasting success comes not from battling competitors but from creating "blue oceans"—untapped new market spaces ripe for growth. Blue Ocean Strategy presents a systematic approach to making the competition irrelevant and outlines principles and tools any organization can use to create and capture their own blue oceans. This expanded edition includes: a new preface by the authors: “Help! My Ocean Is Turning Red;” updates on all cases and examples in the book, bringing their stories up to the present time; two new chapters and an expanded third one—“Alignment,” “Renewal,” and “Red Ocean Traps”—that address the most pressing questions readers have asked over the past 10 years. A landmark work that upends traditional thinking about strategy, this bestselling book charts a bold new path to winning the future. Consider this your guide to creating uncontested market space--and making the competition irrelevant. To learn more about the power of blue ocean strategy, visit blueoceanstrategy.com. There you'll find all the resources you need--from ideas in practice and cases from government and private industry, to teaching materials, mobile apps, real-time updates, and tips and tools to help you make your blue ocean journey a success.